And when it comes to brisket, do you want point or flat cut. This issue really flars up around St. Patrick’s Day each year. 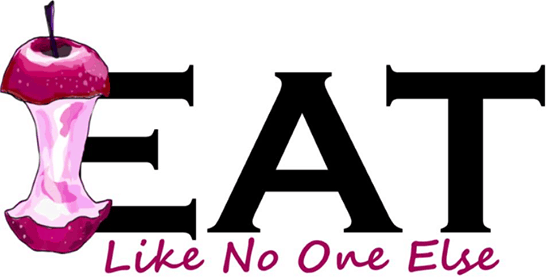 The most commonly served meal on that day (at least in America) is corned beef. Where does corn beef come from? The answer is the brisket. 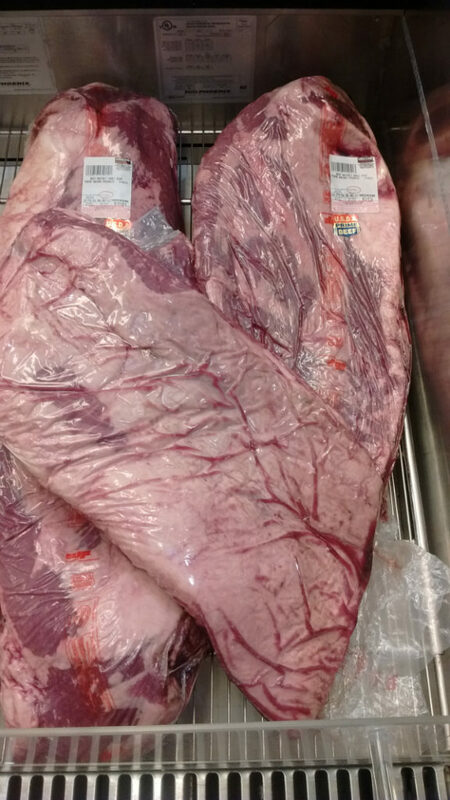 The part of the cow brisket is located is in the front of the cow, toward the bottom, near the cow’s front legs. The Niman Ranch cookbook has great diagrams of where the various cuts in the cow are located. Since the cow uses its front muscles a lot this is a tough cut of beef, so a slow cooking method must be used. Yet it is worth your time because it is a flavorful cut. 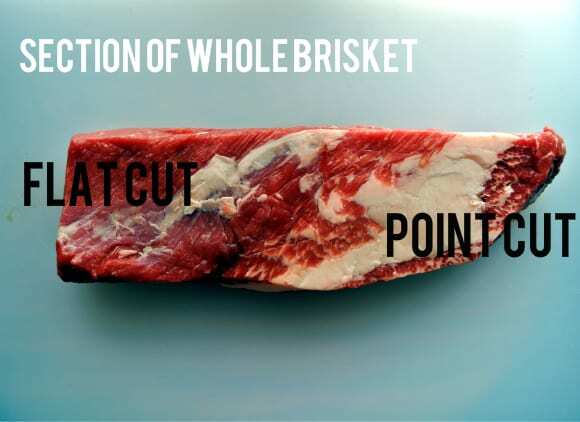 When choosing a brisket, unless you buy the entire brisket, you will have to choose between a flat cut and a point cut. It is very easy to tell the difference by just looking at the cuts. You can see quite a bit of fat there. It’s pretty clear why they call it a point cut. A point cut comes to a point at one end. The point cut has a lot of fat running through it, so when you cook it, it comes out nice and juicy. This cut is harder to find in supermarkets, as it isn’t as attractive of a cut as the flat. This is a good choice if you plan on shredding the meat when finished cooking. A lot less fat in this cut, but still enough to keep the meat moist. The flat cut is a much leaner cut than the point. However it still has a layer of fat on the bottom, that will keep the meat moist. 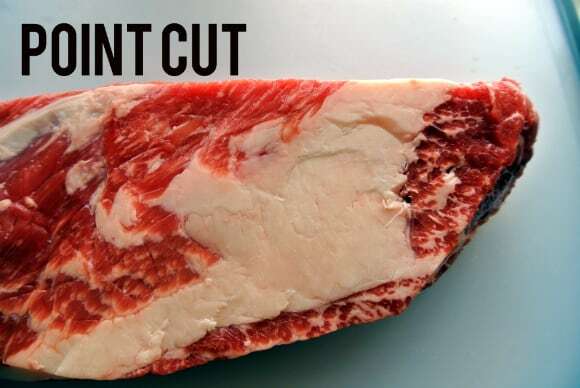 This is the cut you will most often find in supermarkets, as it looks more appealing the the point cut. If you are looking for brisket that will slice up nicely, this is your best bet. It is also the cut used most often when you buy packaged corned beef. It just depends on what you are going to do. 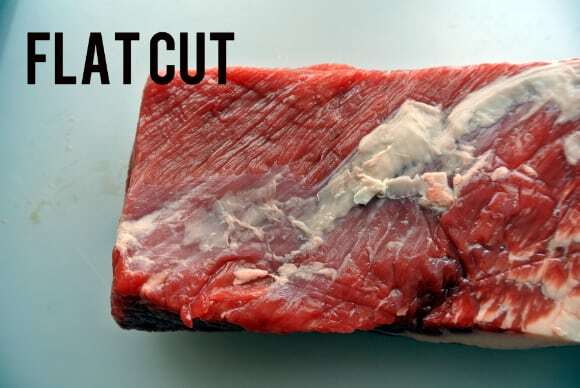 Point Cut is good for shredding, but for corned beef opt for the flat cut. In the Good Eats episode “Pickled Pink”, Alton Brown choose a flat cut to make his own corned beef. I believe as he does that the flat cut is the best cut for corned beef. I prefer the flat cut as the point cut is too fatty for my tastes. I tend to get heartburn from really fatty cuts of beef. A whole prime beef brisket. This would feature a point cut and flat cut ends. Several times I have seen Costco offering Prime grade beef brisket. I featured it in one of my Costco Food Finds post. Pickling Spices – If you have a well stock pantry you probably can just make your own spice blend. But if you don’t and are looking for a good blend, try this picking spice blend from Boston Spice. You gotta your corned beef spices from the East Coast right? 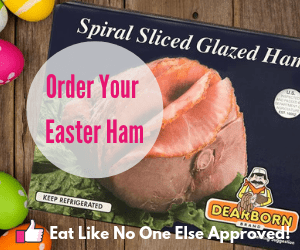 Pink Curing Salt – If you want to give your corned beef that classic pink color, you can get by using a pink curing salt. Blade meat tenderizer – To help tenderize and break your meat done faster, especially if you need to do a quick cure, then I recommend using a blade meat tenderizer. This is not the hammer your grandma uses. This device has small blades that you push down into the meat. Why Do We Eat Corned Beef on St. Patrick’s Day? Why Is It Called “Corned” Beef? What is Uncured Corned Beef? 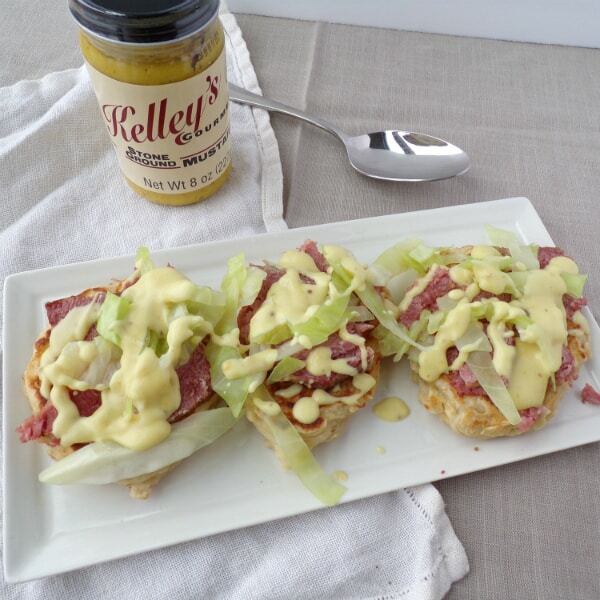 One of my favorite dishes to make with corned beef these Boxty Cakes with Corned Beef and Mustard Sauce. If you enjoyed this post, subscribe to my e-mail newsletter. 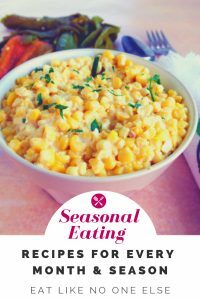 You will get recipes, grocery shopping tips, discounts for my e-books and more delivered to your inbox, once or twice a week. Just submit your email in the box below. For every St. Patty’s, for my Irish relatives and friends, I always buy the Flat Cut Corned Beef. I cook it in my Rival Crock Pot with potatoes, onions, carrots and cabbage. Following the directions I got with my crock pot, I always get a perfect St. Patty’s Day dinner. Delicious! Honestly, if you can cook beef correctly, either is just fine.as a meat cutter, I am learning what cuts are more tender no matter what and what cuts just need more love. Every customer at my store is buying the flat cuts. There r 5 times more flat cuts sold than point cuts. I myself had always preferred the flat cut but tonight I’ve realized that there really isn’t a big difference since I’ve just totally enjoyed the Point cut. Just cook things either longer or use more chicken broth and beer. I just had a point cut that I cooked in crock pot on high for 5 hours with broth and water….amazing! Also amazing is when I slow roast a flat in oven with guiness. To me, no more difference between the two when done right. Costco is selling Shenson’s Butcher’s cut round corned beef. Can I use that in place of flat cut? Will it taste as good? Good question. I have not had that exact one. A Butcher’s cut is whatever they determine that cut is, but I imagine it is pretty similar and you should be able to use it the same with no problems.